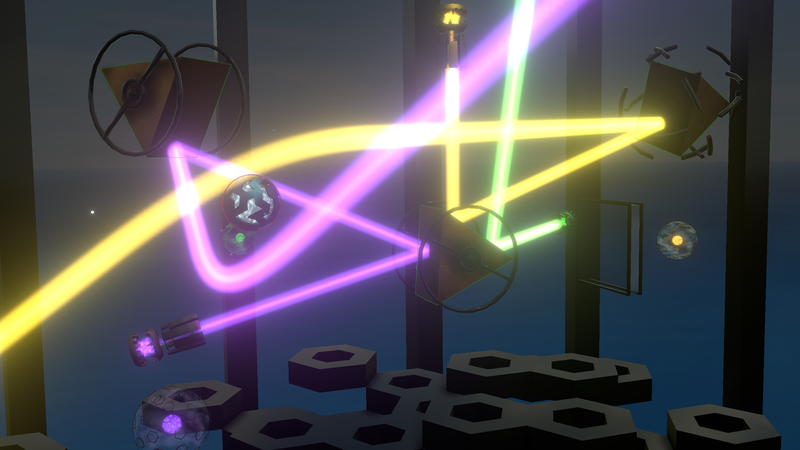 13 responses to "Bending the Light"
Saw this featured on the Oculus store. Looks great! Congrats, Chris. Great game! Went through every level of light bending. Gone through all of them again getting the collectables. Went through all but 2 a 3rd time getting the super-secrets. Need help finding the last 2 constellations! There’s no help so far as I’ve been searching. Need tips please! This game looks interesting, but seems to be largely ignored. Are there any professional reviews? I haven’t seen any professional reviews. Just a couple of pre-release articles on a few of the VR sites which were from press packs I sent out. None of the sites played the game before posting their articles. The only thing close to a review I know of is this youtube video, where a couple of German (I think) guys play the game for quite a while. I don’t speak German myself, but they seem to be enjoying their time with it! I’d suggest only watching enough to see if the game is for you or not. You’ll get more out of it solving the puzzles for yourself, rather than watching someone else solve them. Thank you for your kind review! I’m afraid I don’t speak German, but Google makes a surprisingly readable translation of it. Downloaded today, play on Oculus Rift. Couldn’t find how to exit game and ended up going into keyboard mode. Need help to return to oculus hand controllers as keyboard mode is worthless. You can press Alt+F4 any time to quit, just like every other Windows app. Or you can use the Oculus menu from the Touch controllers. Press the Oculus menu button on the right hand, then find the Home item on screen. To return to Touch controller mode in-game, look at the controller button in the settings menu and press the spacebar. It’s a legacy mode for people without the Touch controllers. awesome game, we have played it together for a few nights now, and we’re at stuck at the atoms for incarceration, everything else is done! Tried it for an hour and could not do anything. Do you have any smallest hint that might help us? Thanks a lot for that great title. Investigate the stalactites hanging down from the main level rock… Post again if you need more of a hint. Well done for getting so far on your own! Awesome, Completion! Thanks for your hint and this awesome, wonderful, surprising game. We had a lot of fun playing. (You can delete the hint now if you want). Thanks for your kind words. I’m glad the hint helped, and well done for getting all the way to the end. Not an easy feat by any means!